Should I mulch? Or bag my leaves this fall? 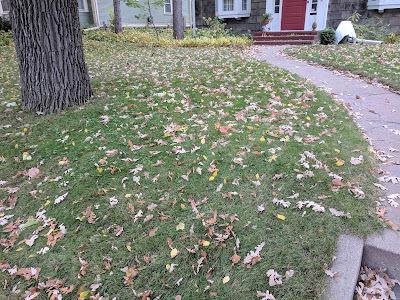 Many homeowners wonder if they should be collecting and removing tree leaves from their lawns prior to mowing, or if the tree leaves can be mulched (mown) into the lawn. Like many recommendations for lawn management decisions, this one can also be answered with the phrase, "it depends." It will be difficult to fully mulch this many leaves and not cause problems to the turf before going into winter. Collect them and compost off-site. 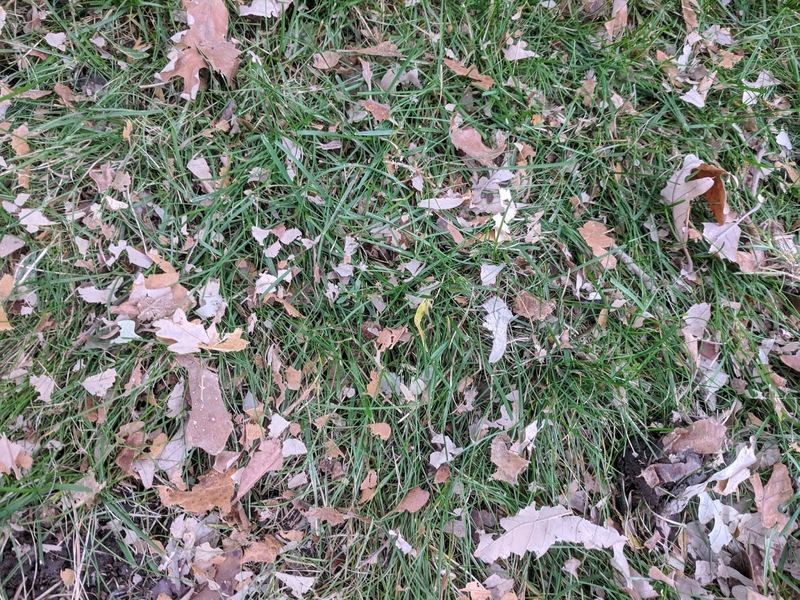 What amount of leaves are present before and after mowing? How long after being mulched will the leaves be on the grass? What are the air and soil temperatures in the next few weeks? This amount of leaves could be mulched without leaving too much litter on the turf and soil surface. When it makes sense...free fertilizer! In general, the preferred choice would be to mulch the tree leaves when you mow the grass. Most deciduous tree leaves are around 2 percent nitrogen, which is the most important nutrient for plants. So, by mulching your tree leaves into your lawn, you are essentially getting a free fertilizer application of nitrogen. There is even one report of maple leaves reducing dandelion numbers in lawns the following spring after leaf mulching. Truly, some leaf litter can be good for a lawn. 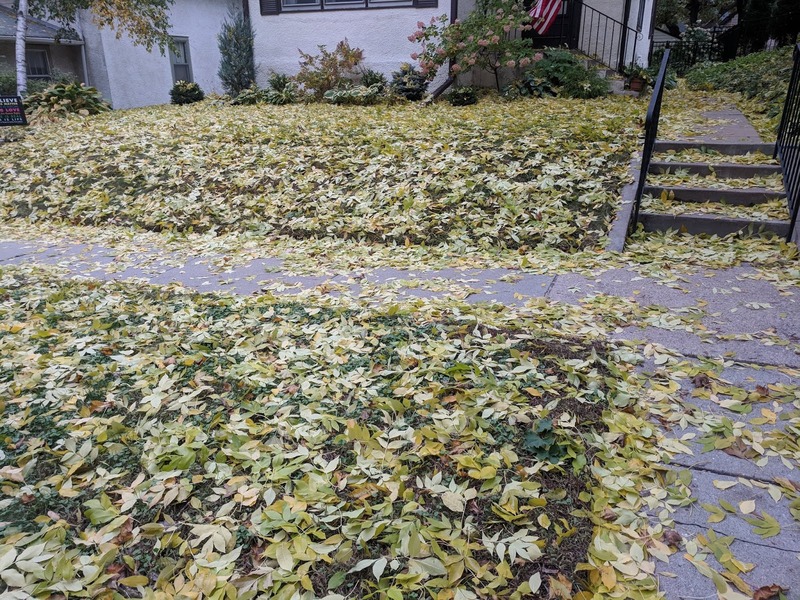 Successfully mulching leaves into a lawn canopy requires more frequent mowing in the fall and possibly several passes with the mower to mulch the leaves sufficiently. Specialized mulching mowers are available, and these mower types will also be beneficial year-round to mulch grass leaves into the canopy. Chopping leaves into small pieces is important. It shades out the turf at one of the most critical times of the year that the grass plants are storing carbohydrates before the winter. It increases the incidence of snow mold diseases, resulting in dead patches of turf or a thinned canopy during spring green-up. It slows the spring green-up by reducing soil temperatures in the spring, by acting as a mulch layer on the soil surface. It provides a more suitable environment for burrowing pests like voles. 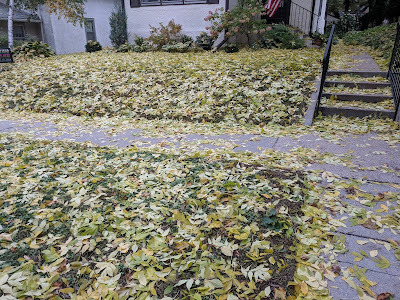 So how do you know if you have excessive tree leaves? The best way is to try mowing a pass or two and mulching the leaves. Make sure that no more than 20 percent of the turf is covered by tree leaves after being mulched. The leaves have been mulched but there may be too much litter left on the surface. Mow more often to chop up the leaves or collect the remaining leaves that fall. 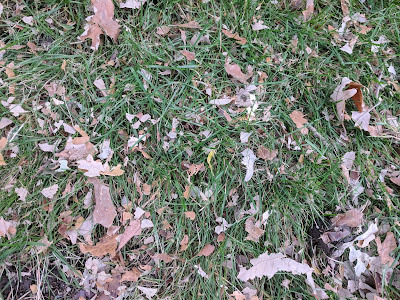 What leaves make the best mulch? Some tree leaf species are more easily mulched than others. Ash and maple tend to be more difficult to mulch than oak leaves, for example. Also, wet leaves will be more difficult to mulch than leaves that are dry, so if possible, avoid mulching leaves until they have dried. Generally speaking, the finer the leaves are chopped up the better, as they will be broken down more quickly by weather and soil microbes. Depending on the amount of trees in your area, you may need to mow more frequently than what the turf needs if your objective is to mulch the leaves. If you have any questions about any of the above or any other general turf management questions, contact me at jtrappe@umn.edu.